Guess what I made? Yes, some wrist warmers! When I get in my car in the winter, the steering wheel is always cold to the touch. I could wear gloves but.... ladies and gentlemen, I know this always comes as a shock... I'm a smoker and you can't smoke in gloves. The little holes are for my thumbs and I don't do all those buttons up every time I put them on, I just slip them on. I used this free pattern by Sandra Paul of Cherry Heart and it worked out great. I used the only buttons I could find a set of, which was these mismatched painted ones. They don't match, but they do sort of go together. I'm not sure I like them on these wrist warmers, but they're covered by my coat sleeve anyway. I'd love to tell you what yarn I used to crochet these, but I honestly can't remember. I do know it was superwash, so I can put them in the wash. I make a point of never having a photo of me on my blog as I hate photos of myself, so this is all you will see of me. Don't I have odd thumbs? p.s. comments about how I should quit smoking are not welcome! I am fully aware of the dangers and what it does to me, but right now, with my mental health the way it is, it's not the right time to put myself through quitting. 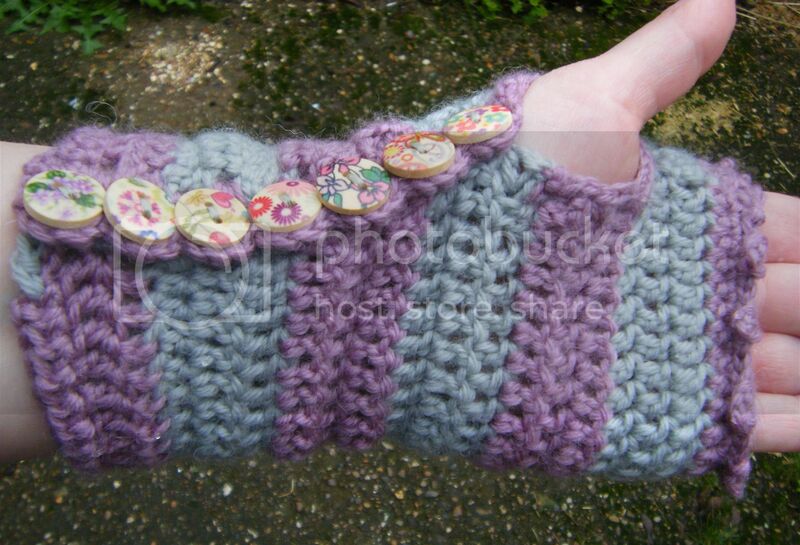 Wristwarmers are wonderful for crafting in a cold house, too - although I'm dashed if I would have all those buttons! Love the wrist warmers! I Wear them and I don' smoke. these are a great idea and think I will have to try and follow the pattern, not for driving but in the house as I get so . 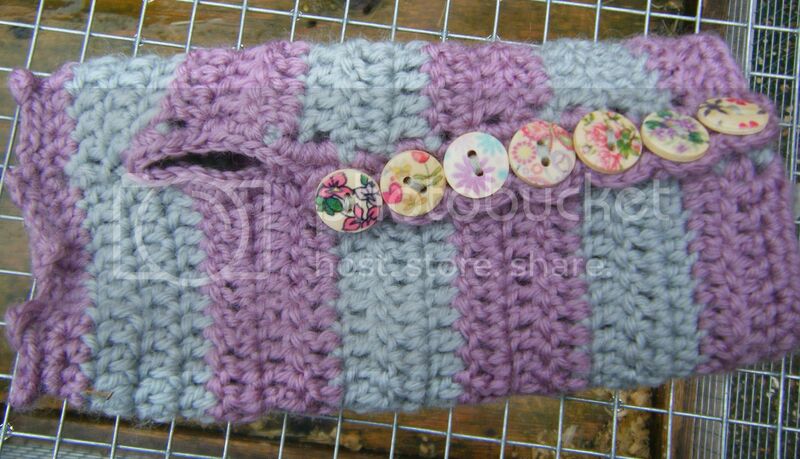 I think your choice of buttons is great, they make a lovely feature on your wrist warmers - very pretty. 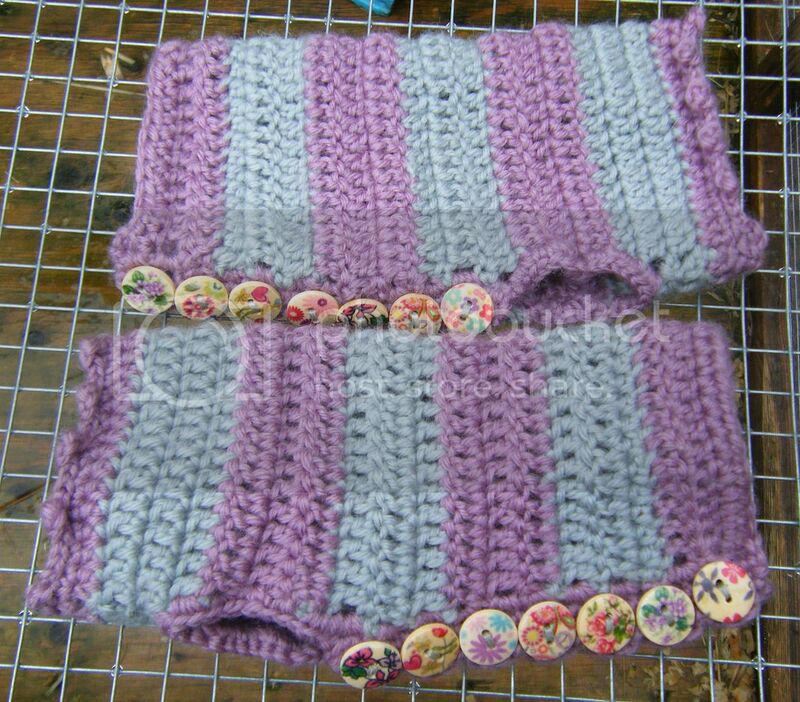 I am going to crochet some wrist warmers for myself one day. Love those buttons.